Last week the site of a historic former Birmingham music venue which hosted The Beatles and Rolling Stones was destroyed in a fire. The fire broke out at 5.00am and the police cordoned off Kings Heath High Street between Popular Road and Silver Street. Officers said they were treating it as suspicious. No-one was hurt. 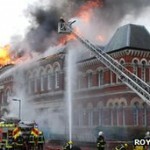 Last week a fire broke out in a building in Southwark which houses a library, a museum and the council “one stop shop”. 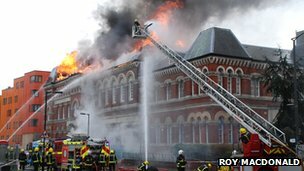 The blaze in the four-storey building in Wansey Street, Walworth was tackled by almost 120 firefighters and 20 fire engines, with the roof of the library and museum on fire..
30 people were evacuated from inside the building, which houses Newington Library and no injuries have been reported. Councillor Peter John, leader of the council, said: “It is too early to say what the cause of the fire is and how long services from that building will be suspended for. It is not known how the blaze started, the fire brigade said. A major fire at an independent school in the west end of Glasgow broke out last week and up to 60 children were led to safety. 55 firefighters and 10 appliances were deployed to prevent the fire spreading and Incident Commander, ACO Lewis Ramsay said: “The initial crews have worked tirelessly to tackle the blaze and operations are ongoing to contain the fire. “Members of the local community can be assured that fire crews will continue to work relentlessly until this incident is brought to a safe conclusion. A joint investigation by Strathclyde Fire and Rescue and Strathclyde Police will determine the cause of the blaze that is not yet known. New fire service figures have been released and it has been revealed that cigarettes caused every fatal house fire in Lincolnshire in 2012. Although the figure of accidental dwelling fires fell to 212 compared with 365 in 2011 and 380 in 2010, fatalities rose from one to three. It was added by the fire service that those involved in smoking-related fires often needed more medical help and officers said such incidents tended to happen as people were falling asleep and appealed for smokers to take care. The Fire Safety Manager said: “These accidental fires often start when people are at their most vulnerable, which is why they are so often fatal. It is advised also that smokers should always use an ashtray, never smoke in bed and make sure the contents of ashtrays were completely extinguished. A grade II listed property in Appleshaw, Hampshire was badly damaged following a house fire where 60 firefighters from Hampshire and Wiltshire were called to the scene. 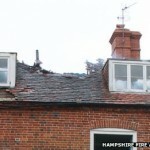 Hampshire Fire and Rescue Service said the roof of the family home was “well alight” when they arrived, however no-one was injured in the blaze. The house is occupied by John Goold and his family and he described the experience: “I thought ‘That looks a bit too close to home’, and when I got back the family were in the garden in their pyjamas. “There was a lot of smoke and it was pretty scary. I can’t overstate how amazing the fire brigade were,” he said.